Scott O’Neil is a conductor, orchestrator, composer, arranger, pianist, and public speaker. I first became aware of Scott through his nine-year tenure as Resident Conductor with the Colorado Symphony. In addition to work wearing all the hats listed above, he leads the Rosetta Music Society and hosts a radio show on Colorado Public Radio’s classical stations. He is as busy as his talents are diverse. When I recently heard that Scott was orchestrating and conducting for “Weird Al” Yankovic this year, I had to reach out to learn more. 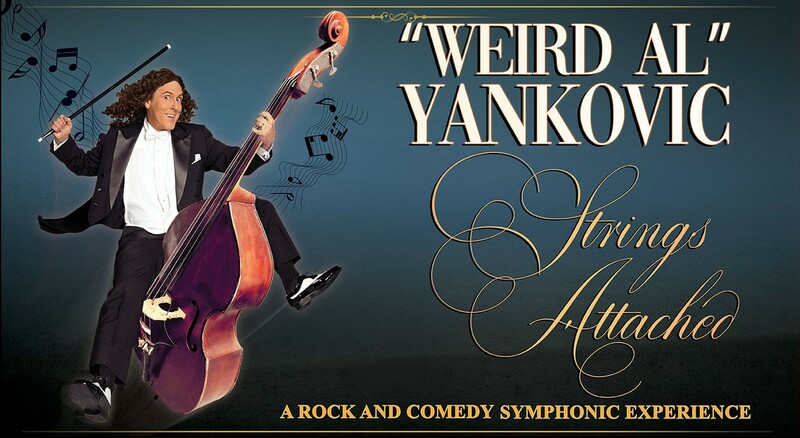 What is “Weird Al” Yankovic’s “Strings Attached”? This is Al’s first tour in which he’s performing with an orchestra at most if not all of his stops. He’s done concerts with an orchestra before (for which Sean O’Loughlin created some excellent orchestrations), but I’ve written the new charts for this tour. How did you first connect with Al? I used to be the resident conductor with the Colorado Symphony, and I continue to create arrangements and orchestrations for them. Colorado continues to be very proactive in producing new concerts/shows, so they proposed my work to Al and his team. Al will perform with the Colorado Symphony at Red Rocks in August, where I will get to conduct as well. What is your workflow with Al? What direction are you getting from him? Are you sending him MP3 or Finale files? Al started by sending me a very thorough email with direction on what he hoped to hear from each chart. He indicated where he wanted to stay true to the commercial recordings, where I could take some liberties, where he wanted to hear more/new input from the orchestra, etc. We then chatted by phone about specifics. As I created each orchestration, I’d send him a PDF of the score and an MP3 file (converted straight from an AIFF file from the Finale file). Sometimes I’d combine his original recording with my Finale MP3 file so he could hear how they’d work together. He’d give a listen and provide his feedback. He was always very constructive and easy to work with, and as we progressed I figured out his tendencies – what he liked and didn’t like – so the subsequent charts needed fewer and fewer alterations, sometimes none at all towards the end. He was an absolute joy to work with! Do you have a favorite Al arrangement that we should especially look forward to? It’s tough to say, but if I had to pick just one, it would probably be Jackson Park Express. It’s the longest and most challenging chart I had to write, and it required the most “arranging.” I particularly fell in love with his climax, so I really tried to expand the orchestral contribution there, and I can’t wait to hear it. I laughed when Al wrote back, “It sounds pretty stinking majestic to me!” That may be the best compliment I could ever hope for from Al! What sort of questions were you asking yourself in the creative process? The biggest question is always, “How does my musical taste/intuition match or converge from the artist’s?” I don’t want all my charts to sound the same. As much as possible, I want them to sound the way the artist would write them themselves. I’d rather magnify who/what they are than simply put “my stamp” on it. What makes this project particularly fun (or particularly challenging)? One thing that’s unique to Al’s music is just how important the lyrics are! Whenever you’re doing vocal charts, the orchestrator needs to make sure they are being as supportive and creative as possible without getting in the way of the solo vocal line. With Al’s music, it goes a step further, as his music really relies on the audience really needing to hear every word, as sometimes the humor or satire turns on a single word. I love to make the orchestra sound rich (think Strauss or Respighi), especially when performing outdoors, but much of what can be learned from such great orchestrators as these simply isn’t appropriate for projects like this. Do you have role models for your orchestration or arranging? In terms of arranging jazz and modern music, I’ve probably learned the most from Nelson Riddle and Donald Sebesky. Both of them have such taste and imagination! I’m always learning from charts I conduct and listen to (the best teachers are the pieces themselves!) and names like Jeff Tyzik (a great guy I’ve met a few times), Chris Walden, and Vince Mendoza immediately come to mind. Coming from more of a classical background, I most admire Maurice Ravel, Ottorino Respighi, Richard Strauss, Gustav Mahler, and Igor Stravinsky. No course in orchestration could ever teach what these composers’ scores have to share! We just have to have the ears to hear them, the minds to compare them, and the curiosity to seek them out! What was your introduction to Finale? What were you using before? Finale was the first program I used way back in college in the early 1990’s, and I’ve stuck with it throughout my career. What do you like about Finale? What would you change? I like the flexibility and control I have over the visual representation of the score, and the sound quality is very high, so the files I send to the artists give them a fairly good idea of what’s going on. As far as what I might change, I insist on putting given instruments on one line (e.g., clarinets on the same line, vs. a different line for 1st and 2nd). When I’ve done all the work to make sure dynamics and crescendos line up properly on the full score, I would prefer to see that in the managed parts, even if I have to shift them all together (shifting them all separately is far more tedious). Particularly when there are different layers in the score, the dynamics get shifted in the parts, and then I have to do all the alignment over again on each part. I wish the spacing of the dynamics weren’t so sensitive, changing the distance from the staff, as it makes for far more work in editing parts. Do you have role models for what your notation should look like? Do you, for example, refer to specific notation texts? I’ve benefited from seeing innumerable charts come through as a conductor, and I’ve gotten invaluable advice from orchestra librarians at the Colorado and Utah Symphonies, so I adhere fairly closely to the MOLA recommendations. In your tenure as resident conductor of the Colorado Symphony you worked with an incredibly wide range of musicians, from Itzhak Perlman and Joshua Bell to Ingrid Michaelson and Steve Vai (readers – see a remarkable list here). What did you enjoy the most? I enjoyed many things, like bonding with Itzhak Perlman over our shared love of wine (and spontaneity in performance), the comforting naturalness of Lang Lang’s musicianship (he’s very free, yet very cooperative! ), the precise-yet-loose feel of Chris Botti and his band, the fiery impulse of Nadja Salerno Sonnenberg, the warm humanism of Van Cliburn, the graciousness of Joshua Bell in going over the score before rehearsal… where to begin? One of the most engaging interactions I had was with Steve Vai. He’s so meticulous and precise, yet his performances are so impassioned! I gave input on his scores, which he took very graciously. He gave me advice on notation (particularly for guitar, which is not an instrument I play, so it’s incredibly valuable and useful). He had such great stories to tell about working with Frank Zappa, and he was so kind, insightful, and gracious – truly a consummate musician! I find that when artists recognize that the conductor is truly an ally (and there’s much that can be said about that! ), they all share the best of themselves. Bela Fleck is another artist who has influenced me a great deal. He’s just got such an amazing balance of freedom and cooperation! You know he’s counting on you to do your part, but he’s also very supportive in reacting to what he hears, so you feel the unshakable confidence that nothing can go wrong… which I find inspires the most artistic performances. You lead your own ensemble, the Rosetta Music Society, you’re an on-air personality on the Colorado Public Radio Classical station, you’re a public speaker, a busy freelance arranger, orchestrator, composer, and conductor. You’ve given a TedxTalk. Do you have a favorite role, or do you enjoy the variety? What do you do when the various orbits of your schedule universe collide? I enjoy the variety, but nothing compares with being onstage, conducting a great orchestra, and feeling the immediacy of the moment and the audience. I love Pat Metheny’s work, and I recently got to perform my orchestration of Minuano with the orchestra at CU Boulder, and the feeling of performing that work with young musicians was a recent highlight. There simply aren’t words to describe it. A mix of fun/elation/fulfillment/worthwhileness, etc. What would you like to do that you haven’t yet done? I haven’t been a music director for an established orchestra (i.e., one that I didn’t assemble). I’ve learned so much from working on the inside with orchestras for so many years in positions beneath a music director, I’d love to put that to work (put it to the test). Orchestras (and their influence on a community) can be such a noble pursuit when done properly. I’d like to offer my contribution! Bela Fleck is getting the original Flecktones (Bela, Howard Levy, Victor Wooten, and Futureman) back together, along with his wife – Abigail Washburn, Sam Bush, and Jerry Douglas for a “Bela and Friends” concert at Red Rocks, May 30. We’re working on choosing rep, writing new orchestrations (some him/some me), and fashioning a show with more talent onstage than can be given its due in one concert. That’s both challenging and thrilling. I’ve worked with the Flecktones once, conducted Victor Wooten’s concerto once, done transcriptions and arrangements for Abigail, and worked with Bela several times in various roles, so I’m eager to meet Howard, Sam, and Jerry and be on the podium for what promises to be another highlight for me. How lucky am I?! After that, I’ve got a show with Tenacious D (Jack Black and Kyle Gass), which I’m just now starting to get my head around and start writing. I’m fairly sure that it will be their first live concert with orchestra, so the TLC a project like that needs also has me excited. I’d like to thank Scott again for speaking with us. I love where he asked, “How lucky am I”? While it’s obvious his success is the product of a lot of hard work and focused artistry, the idea of working with such a delightfully diverse group of artists really does sound like fun.